Plants annual. Culms 30-200 cm, spreading, decumbent or stiffly erect; nodes usually glabrous or the lower nodes puberulent. Sheaths glabrous; ligules absent, ligule region sometimes pubescent; blades to 65 cm long, 5-30 mm wide, usually glabrous, occasionally sparsely hirsute. Panicles 5-25 cm, with few-many papillose-based hairs at or below the nodes of the primary axes, hairs sometimes longer than the spikelets; primary branches 1.5-10 cm, erect to spreading, longer branches with short, inconspicuous secondary branches, axes scabrous, sometimes also sparsely hispid, hairs to 5 mm, papillose-based. Spikelets 2.5-4 mm long, 1.1-2.3 mm wide, disarticulating at maturity. Upper glumes about as long as the spikelets; lower florets sterile; lower lemmas unawned to awned, sometimes varying within a branch, awns to 50 mm; lower paleas subequal to the lemmas; upper lemmas broadly ovate to elliptical, coriaceous portion rounded distally, passing abruptly into an early-withering, acuminate, membranous tip that is further demarcated from the coriaceous portion by a line of minute hairs (use 25× magnification); anthers 0.5-1 mm. Caryopses 1.3-2.2 mm long, 1-1.8 mm wide, ovoid or oblong, brownish; embryos 59-86% as long as the caryopses. 2n = 54. Echinochloa crus-galli is a Eurasian species that is now widely established in the Flora region, where it grows in moist, disturbed sites, including rice fields. Some North American taxonomists have interpreted Echinochloa crus-galli much more widely; others treat it as here, but recognize several infraspecific taxa based on such characters as trichome length and abundance, and awn length. There are several ecological and physiological ecotypes within the species, but the correlation between most of these and the species morphological variation has not been established, so no infraspecific taxa are recognized here. Annual herb 30 cm - 2 m tall Leaves: alternate, two-ranked. Sheaths open, compressed. Ligules absent (sometimes hairy in this area). Blades to 65 cm long, 0.5 - 3 cm wide, usually over ten times longer than wide, linear to lance-shaped, flat, sometimes sparsely hairy, parallel-veined, with a prominent midrib. Inflorescence: a terminal arrangement of spikelets (panicle), 5 - 25 cm long, hairy (hairs sometimes longer than spikelets ), with an elongate axis. Primary branches upright to spreading, 1.5 - 10 cm long, with rough and sometimes sparsely hairy axes (hairs to 5 mm long and bumpy-based). Secondary branches inconspicuous. Fruit: a caryopsis, indehiscent, enclosed within the persistent lemma and palea, brownish, 1.5 - 2 mm long, 1 - 1.5 mm wide, oblong or egg-shaped. Culm: spreading, upright or decumbent, 30 cm - 2 m long, round in cross-section. Lower nodes sometimes minutely hairy. Spikelets: densely crowded on angular branches, 2.5 - 4 mm long, 1 - 2.5 mm wide, flat on one side and convex on the other (plano-convex). Florets: two per spikelet. Lower florets sterile. Upper florets bisexual, compressed dorsally. Anthers three, 0.5 - 1 mm long. Stigmas red. Glumes:: Lower glumes membranous. Upper glumes about equal to spikelets, membranous. Lemmas:: Lower lemmas similar to upper glumes in texture and size, sometimes bristle-tipped (bristle to 0.5 cm long). Upper lemmas broadly egg-shaped to elliptical, rounded dorsally, leather-like. Paleas:: Lower paleas nearly equal to the lemmas. Habitat and ecology: Introduced from Eurasia. Found in moist, disturbed areas. Etymology: Echinochloa comes from the Greek words echinos, meaning hedgehog, and chloa, meaning grass, referring to the bristly spikelets of some species. Crusgalli means cockspur. Frequent to common in all parts of the state. 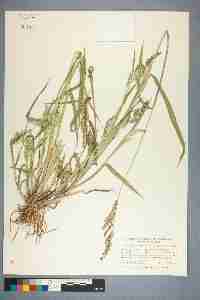 "The common name of this grass suggests that it might be a grass restricted to the vicinity of habitations, which is not true. While it is found in waste places about barns and dwellings, it is found in almost all kinds of habitats except dense shade. It prefers the sunshine. As to soil requirements, it is found from minimacid soils to the marl borders of lakes. It prefers a moist soil but will grow in wet or dry places. It is found in roadside and dredged ditches, in low places about lakes, in bayous, along streams, and in cultivated fields and pastures. "I am regarding this species as a polymorphic one. A careful examination of more than 60 Indiana specimens shows that sheaths are usually glabrous, but sometimes the lower ones are scabrous to more or less papillose- hispid. The spikelets are usually more or less awned, the awns up to 3 cm long, but the spikelets of some panicles are all or nearly all awnless. In one specimen the primary panicle has awnless spikelets and the axillary panicle has awned spikelets. In another specimen the reverse is true. The spikelets of some panicles have scarcely any papillose hairs while those of others rarely have hairs without the papillose base. The amount and length of the pubescence vary on the same plant as well as on separate plants. The color of the spikelets varies from green to purple. In ponds and sloughs, where germination may be delayed on account of the recession of the water, I have seen mature plants only a few inches high in fruit while on the higher margin of the same pond would be plants several feet high. "Some authors have given names to the many forms of this species. Some variations have been called species, some varieties, and some forms. The limit in assigning names seems to have been reached by Jackson who named a 'variegated purple form' of the awnless form (Guide to Nature 16: 11. 1923). For a discussion of the so-called varieties and forms see the literature cited." (Deam, Grasses of Ind. p. 304-305, 1929.) Hitchcock, in his manual of the grasses of the United States, also regards this species as polymorphic, but recognizes an awnless variety.